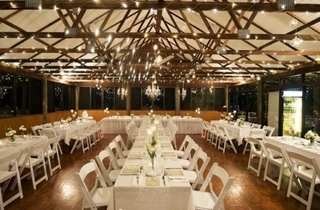 Bundaleer Rainforest Gardens is a treasured family-owned four acre property situated only 20 minutes from Brisbane CBD. 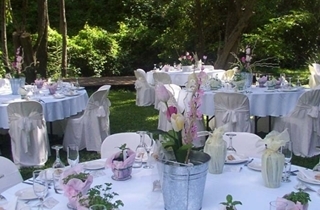 We are the ideal location for those that desire beautiful romantic garden surroundings for their wedding day. 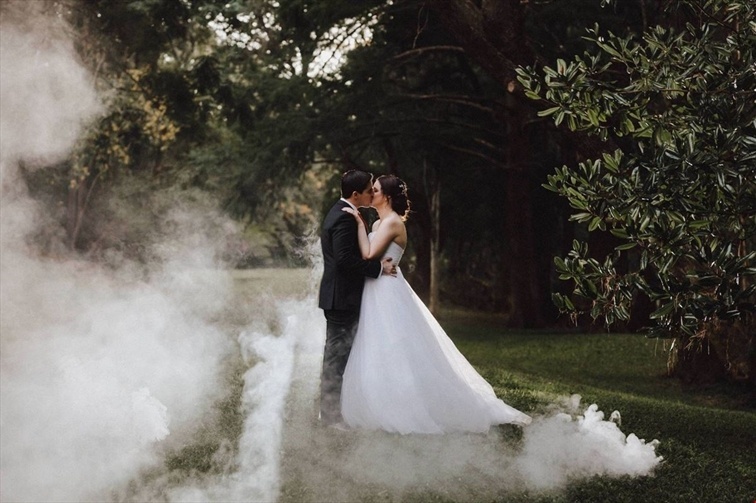 The country views, expansive space and rainforest gardens, all come together to create a stunning background for your special day. Wedding ceremonies can be held in our romantic outdoor garden settings followed by canapés and drinks in our outdoor or deck areas. The property boasts two reception venues including our rustic and charming Treetops Room to our gorgeous purpose-built silk lined Marquee. 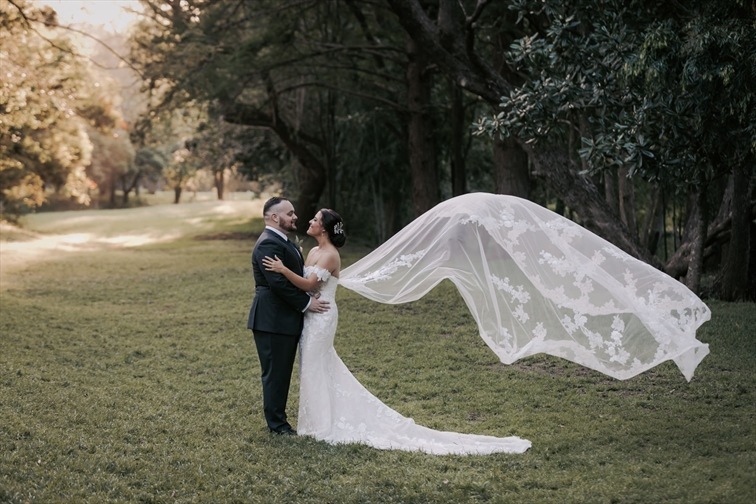 A wedding at Bundaleer Rainforest Gardens offers you the unique advantage of your ceremony, photographs and reception all within the same beautiful vicinity. Following your ceremony at the Jacaranda Tree and canapes in our garden alcove, the stunning purpose-built Silk Lined Marquee is the perfect space for a reception for 50 – 200 guests. Approximately 20m x 10m in size, and fully draped in white silk lining you will have flexibility to style the area from top to bottom. 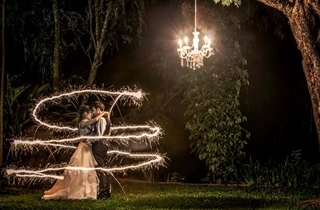 Whether it be beautiful and elegant or country and rustic, the choice is yours! What bride doesn’t love fairy lights, we have this covered with over 150 meters of fairy lights draped throughout the silk lining in the roof to create that perfect ambience along with 2 gorgeous chandeliers. 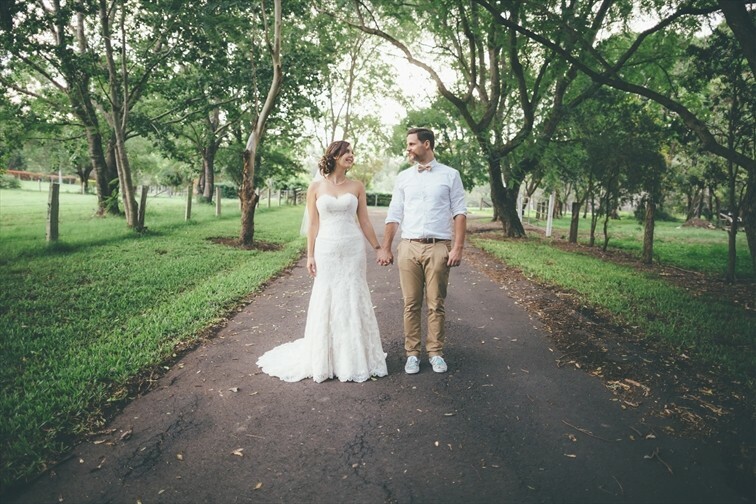 In our wedding gallery you will find you have the choice of round or rectangular tables set in white linen and complimented with white americana chairs. 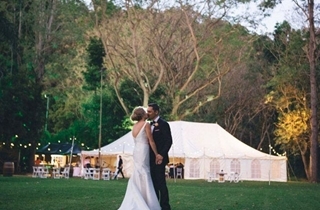 The Marquee lawn area is the ideal space for your guests to enjoy drinks and canapes between the formalities of your ceremony and reception. Set the scene with giant lawn games, as your guests relax amongst beautiful gardens with rustic wine barrels and your own bar area. Our in-house stylist can assist you with your table centerpieces and decorating items from festoon lighting, lawn games to port and cigar bars. 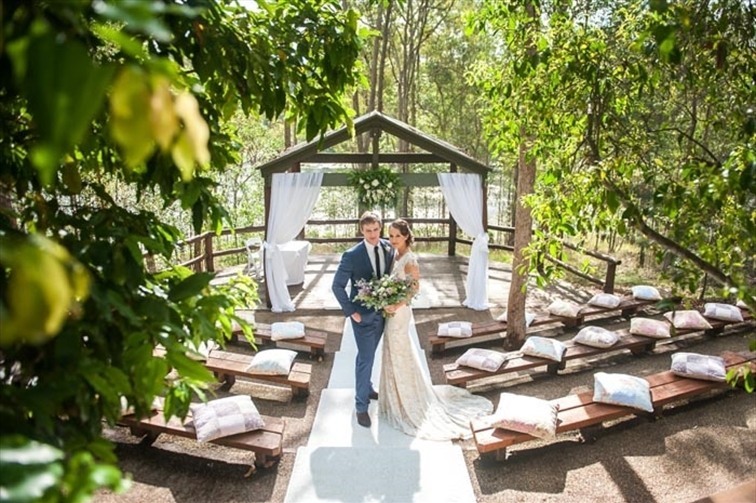 Following your ceremony at the Waterfall Deck and canapes on the Kookaburra Deck, the rustic charm of the Treetops Room is the perfect space for a reception from 30 – 120 guests. Approximately 15m x 9m in size, this space is overflowing with the rustic essence, nature filled charm and alluring beauty of being in the Treetops. The Treetops room is unique, rustic and charming. The room includes roof to ceiling windows on one side that open onto the lawn and bar area to give you the ultimate indoor/outdoor feel. 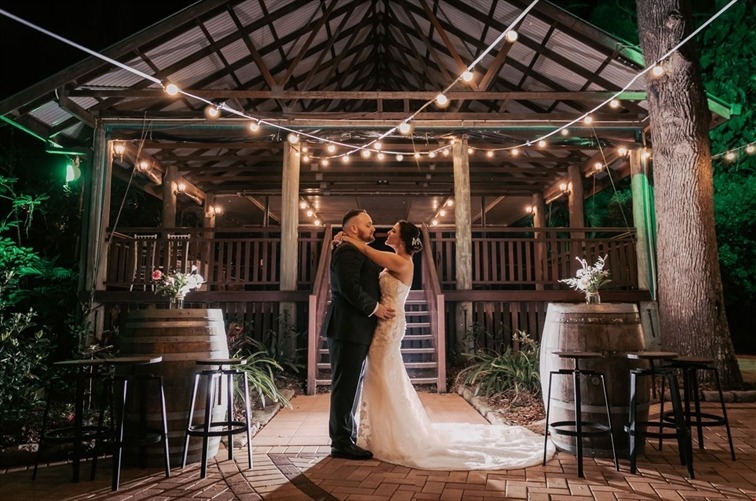 Over-looking the creek and elevated in the trees, the buildings traditional timber structure offers a generous space with high ceilings and timber trusses that are a captivating and eye catching backdrop for your wedding. 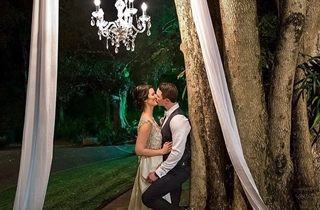 With 3 stunning chandeliers over the bridal table and a ceiling draped with 200m of fairy lights the room provides the ideal atmosphere for rustic weddings to glamour weddings, and the style of yesteryear. Our in-house stylist can assist you with your table centerpieces and decorating items to bring your vision to life. 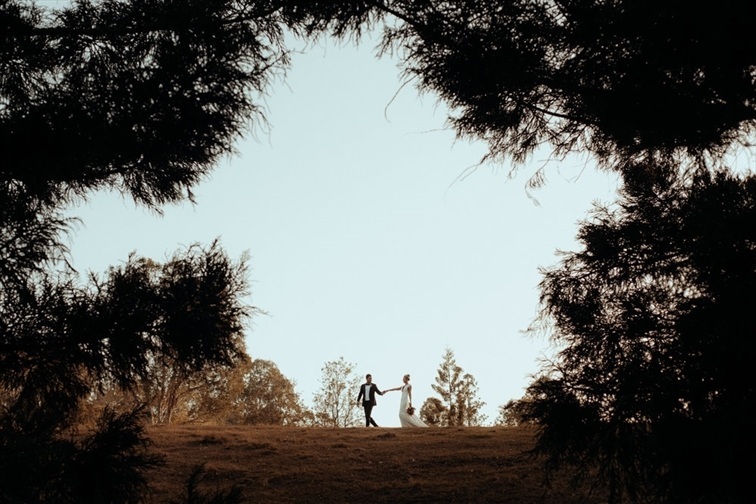 Located next to our Silk lined marquee, the Gumnut Deck and neighbouring lawns provide a welcome, relaxed and open country garden atmosphere to any special event. With settings to match the adjoining marquee this area provides the perfect private location for pre-dinner festivities prior to your special event. Nestled amongst the rainforest trees, the timbered Gumnut Deck is also the ideal setting for a relaxed undercover luncheon for up to 80 guests. The Kookaburra deck is popular for a relaxed undercover luncheon of up to 80 guests seated or more cocktail style. Sitting amongst our majestic rainforest trees, the deck also overlooks the wandering stream. Also available for your private and exclusive use for pre-dinner drinks and savouries when booking the Treetops Room for your reception. With scattered tables and chairs for your guest's comfort, this is a great area with an open casual feel....for guests to congregate and mingle before your special occasion. There are several beautiful areas around the property to choose from, all surrounded by our beautiful natural outdoor setting. 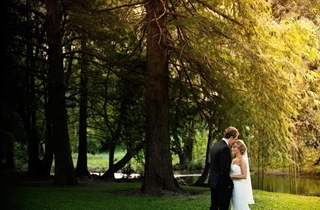 Perfect for lunchtime weddings where your guests can enjoy the great outdoors beside our running stream. Evening functions are permitted at our discretion and are limited to noise levels. Intimate function menu. 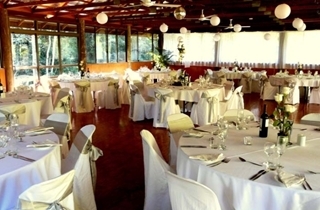 Set price wedding reception for 40 guests. 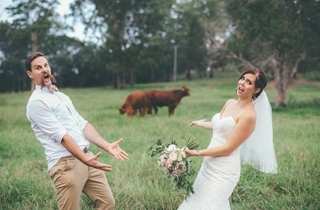 Lunchtime weddings $4,200. Evening weddings $4,500. Some additional expeneses apply as per Inclusions below. Includes corkage for all guests. BYO alchohol. $10pp corkage fee. 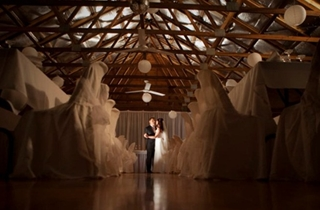 Ceremony Venue is availabile at additional cost. Reduced rate available for lunchtime receptions. Small and Cosy function Imenu. Set price for 30 guests. 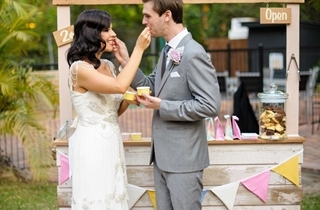 Order alternate drop dessert or your wedding cake as dessert. Includes corkage for all guests. BYO alchohol. Small and Cosy function menu. Set price for 30 guests. Intimate function menu. Set price for 40 guests. Minimum 75 guests for Saturday evenings.